The seasons are turning from winter to spring, at least in colder parts of the world, and it’s time to break out your favorite dew-inducing products. 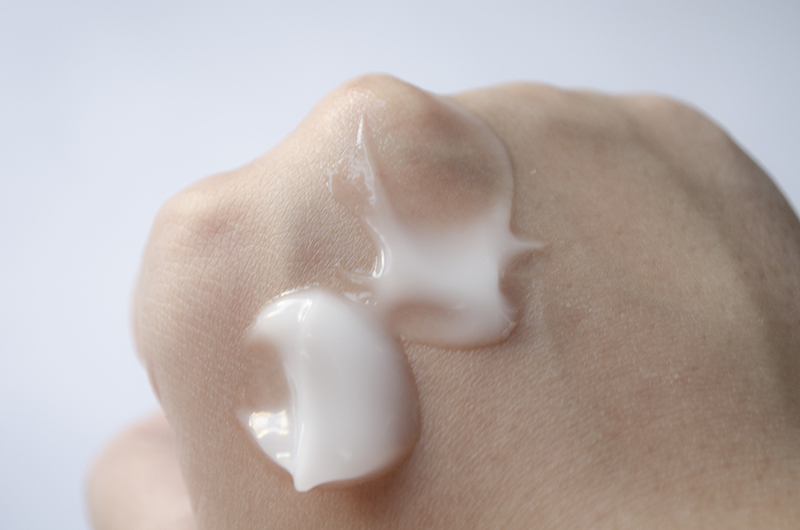 One of the most important all-arounders, no matter what time of the year, is a good moisturizer. 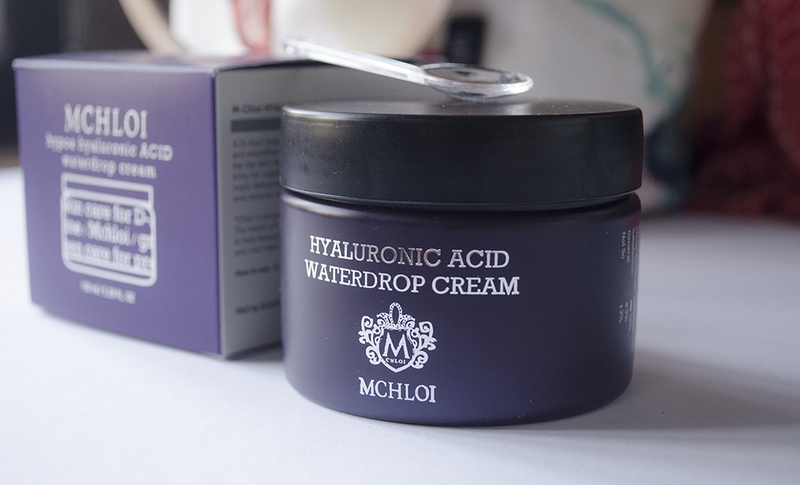 The M-Chloi Hyalyronic Acid Waterdrop Cream* is housed in a pretty sweet regal-looking tub with a substantial scooper. 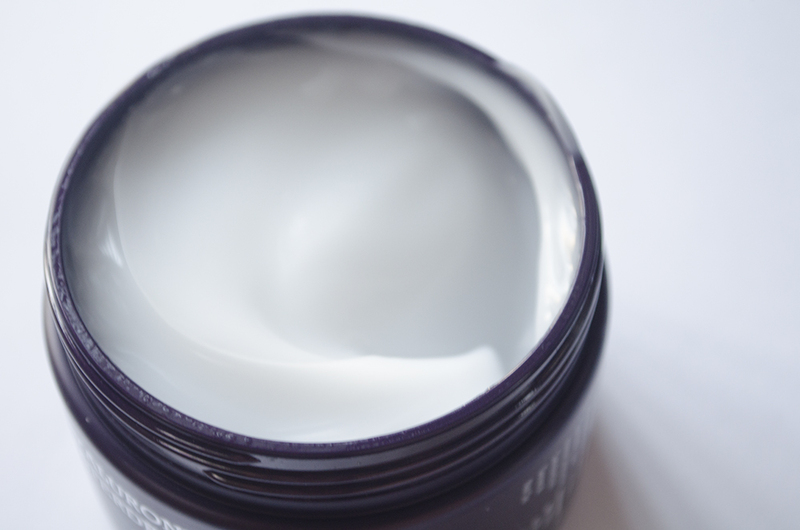 The cream itself resembles a gel, though more opaque. It keeps its shape but has great give when you scoop it out or spread it over skin. The packaging has mostly Korean writing, but a big indicator of this product is in the name anyway. Hyaluronic Acid is kind of a bigwig in the skincare world, because of its reputed anti-aging benefits. Hyaluronic Acid is “a naturally-occurring polysaccharide found in the human body, it acts as a cushioning and lubrication agent for our joints, nerves, hair, skin and eyes.” As we age, we don’t produce as much HA anymore, which is why HA is such a popular ingredient in anti-aging products. When applied topically however, it’s not going to work as well as it might when injected as a dermal filler, directly into the skin’s layers. While it may not bring your skin back to the natural plumpness it had in its youth, it may moisturize it! I say may because other people react differently to Hyaluronic Acid. When used in dry climates, instead of drawing out moisture from the air (mostly because it can’t), it may revert to the moisture already in your skin, bringing it to your skin’s surface but out of your skin. The M-Chloi Waterdrop Cream itself feels very moist and it spreads around pretty nicely, but I have pretty dry skin already and it doesn’t feel like it’s enough for it. I did end up spreading it all over my arms (since I scooped out too much) and it made my skin feel supple if only temporarily. The packaging has an indicator of responses by people who’ve used this before and you can see that it’s sort of a crowd favorite. While it didn’t provide “intense satisfaction” for me, it also didn’t irritate my skin, like what happened with Kine. We both have dry skin, but I think I live in a country with a more humid climate, which may be why this was more agreeable with my skin. I think this would be great for an immediate skin boost, but I’m not sure if I will be able to rely on it by itself for maintenance and routine.